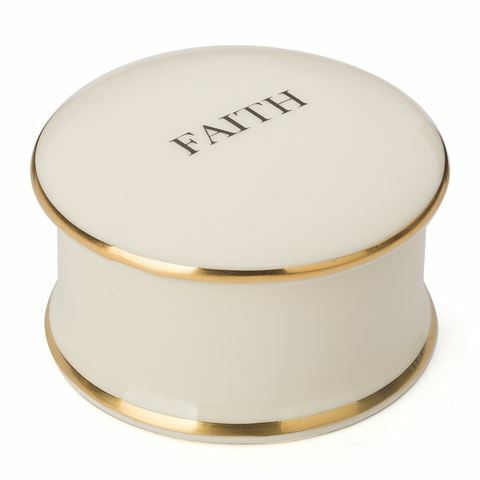 Treat yourself to a stunning new piece of homeware with the Big Tomato Company Seven Heavenly Virtues Faith Trinket Box. Each item in Big Tomato’s Heavenly Virtues range features a print inspired by one of the famous virtues – justice, prudence, temperance, charity, fortitude, faith and hope. This trinket box also features a stunning 22 carat rim and is perfect for storing all sorts of items. Crafted from cream bone china. Features a 22 carat gold rim. Dimensions: 6cm (d) x 3cm (h).